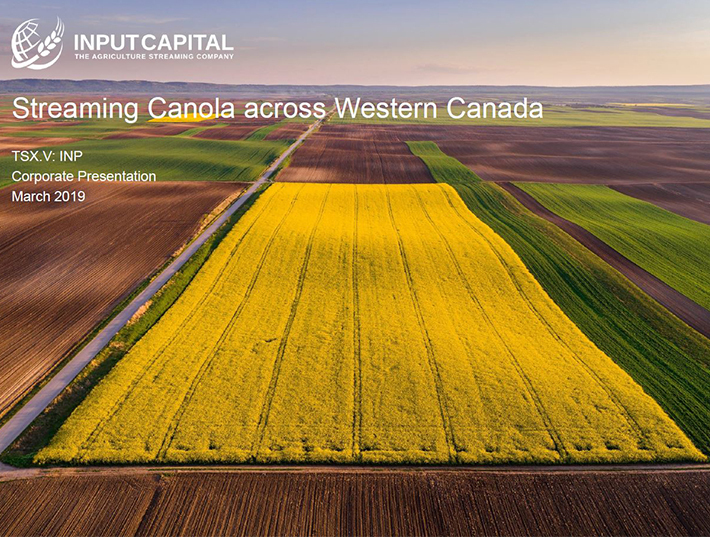 Input sells canola primarily to domestic canola crushing plants whose customers tend to be in Canada and the USA, not overseas. Only a small percentage of Input's canola sales are into the overseas canola seed export market. Approximately 95% of Input's sales of 2018 crop are complete and the remaining 5% has been contracted for sale for several months at higher prices than prevail today. For example, for a recently delivered canola load, Input was paid proceeds of $495.40 net per tonne, even though the spot bid price at the same location is $409.40 net per tonne. Our marketing stream clients are receiving about $470 net per tonne this year, compared to spot bids today of $410 to $425 per tonne, depending on location. Our mortgage streams offer a guaranteed canola price for the term of the mortgage. This price certainty helps farmers plan ahead and sleep at night without worries about market fluctuations. We encourage and support the Canadian government's efforts to end the uncertainty currently being faced by western Canadian farmers by resolving these trade issues as soon as possible.